We put our state of the art equipment and our engineering experience at your disposal to turn the vision in your mind into the furniture in your home or office. Working with your dreams our 3d tools transform your thoughts into a detailed design and from there bring them into existence. Our modern equipment can create your furniture with ease and accuracy due to the enormous range of processing capacities our machinery has. 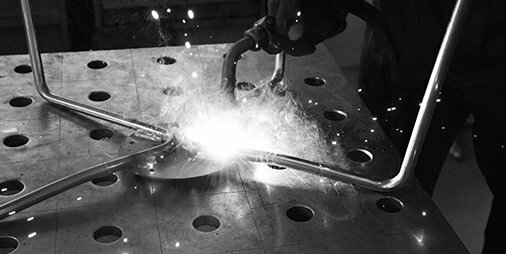 Our machines are designed to do whatever it takes to transform our materials into your fantasy; from working with wire bending, through the whole cutting and shaping process, and onto our multifunctional welding robots which can perform Oxyacetylene, Tig and Mig welding in the most difficult to reach of places. For your piece of mind and security we are ISO 9001:2008 certified. We can test your test piece and use our in-house Catas machine to run a CATAS EN 1728:2000 test to ensure adherence to European standards on wear, resistance and durability. When the furniture has been formed we work with reliable suppliers to offer a variety of finishes in order to perfect the completed piece. These may be as straightforward as paint or involve epoxy powder coating, chrome plating, galvanising or cataphoresis. We will help you to determine which is the most suitable finish for your product taking into consideration its intended use and your conceived aesthetics for the piece. Albacustom combine the best of computer accuracy and human skill to create a partnership of ability to bring your imagination to life.